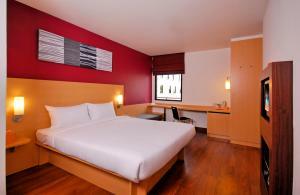 Located in the heart of Bangkok, Ibis Bangkok Sukhumvit 4 is 500 metres from Sukhumvit. It features 2 dining options, a 24-hour front desk and rooms with a flat-screen TV. Modern décor and hardwood flooring feature throughout the non-smoking guestrooms at Ibis Bangkok Sukhumvit 4. 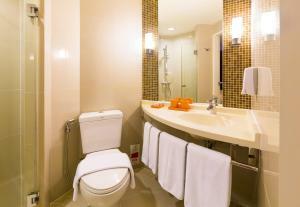 Each well-appointed room is fitted with a personal safe and en suite bathroom with a hot shower. With a 24-hour front desk, the hotel provides fax and photocopying services. Car rental services can also be arranged. Taste restaurant serves a breakfast buffet spread of local and international dishes. Light snacks and refreshing beverages can be enjoyed at the bar. 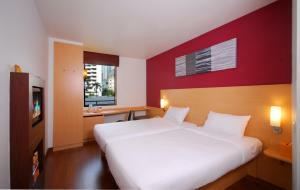 Ibis Bangkok Sukhumvit 4 is 950 metres from Nana BTS Skytrain Station and 2.5 km from MBK Shopping Mall. Suvarnabhumi International Airport is 21.5 km from the hotel. Please be informed that ibis Bangkok Nana offers a free shuttle from the property to BTS Nana during the operating hours as listed below. Please note that the shuttle runs once every 30 minutes. Monday - Friday: 08:00 - 16:30 hrs. Saturday - Sunday: 08:00 - 18:30 hrs. Please be aware that the shuttle does not run between 13:00 - 14:00 hrs. 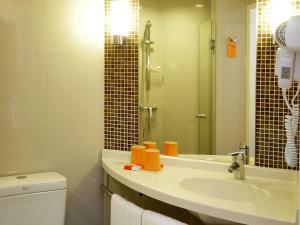 Air-conditioned room features a flat-screen TV and private bathroom with shower facilities. Please note that the maximum occupancy is 2 Adults and 1 Child under 12 years (see Extra Bed Rates). Rate: THB 1342.60 ... THB 1965.59; select dates below to get current rates. 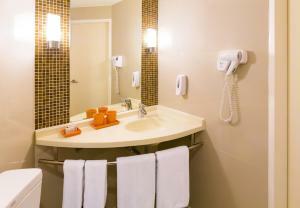 Air-conditioned twin-sharing room features a flat-screen TV and private bathroom with shower facilities. Please note that the maximum occupancy is 2 Adults and 1 Child under 12 years (see Extra Bed Rates). Rate: THB 1345.76 ... THB 1936.17; select dates below to get current rates.